Uploaded Table is a Report Widget that allows you to add your own custom data in a table format alongside your other Report widgets. In addition to CSV files, you can easily add a Google Sheet URL as your source. What are some common reasons to use Google Sheet data? Keep Data Fresh: Your Uploaded Table will always have the most recent data from your Google Sheet. 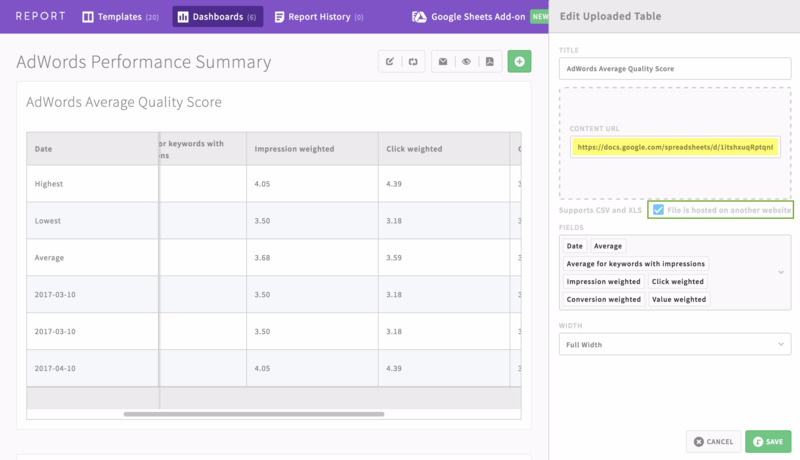 Advanced Calculations: Show data from custom formulas in your Report Dashboard. Complimentary Data: Add more meaning to your Dashboard by including data from other sources such as Salesforce. How do I set up Google Sheets as the source? Step 1: Format your sheet data into columns with headers in the first row. 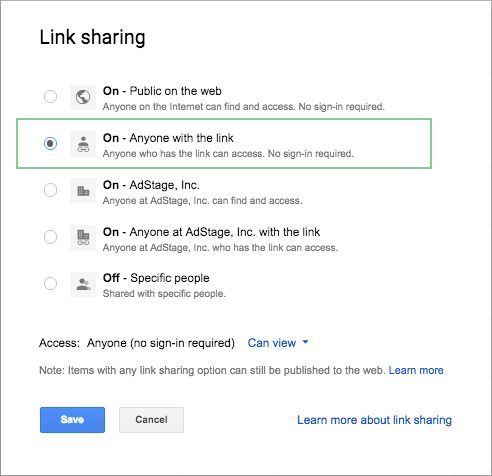 Step 2: Make your data accessible by selecting "On - anyone with the link" from the Link Sharing options. You can also change Access to "Can view". Step 3: Copy your Google Sheet URL to use within Report. Grab either the URL of the Google Sheet, or the Shareable Link, either will work. Note: This URL will always return the first tab in the sheet you are viewing. Select the checkbox for "File is hosted on another website"
Paste in your Google Sheets URL from the previous step. Give your widget a title and click Save. The Uploaded Table widget will only grab data from the first/active sheet. All other tabs will be ignored. The column headers of your table must be in the first row to populate in Report. TSV sheets must be saved as CSV before uploaded to Report. Make sure all cells are filled. Columns with blanks may not load properly. The first cell "A1" - must be filled, or you might see some inconsistencies in your sheet. Merged cells - can cause irregularities in rendering your table. Views might be skewed to showing only one column. Consider breaking your table into multiple upload widgets. Have questions about getting started with Report? Feel free to reach out to us at support@adstage.io.